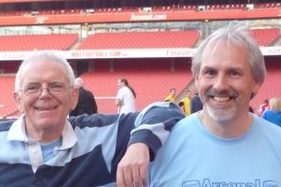 This is the web site of the AISA Arsenal History Society, part of the Arsenal Independent Supporters Association. The Society is recognised by Arsenal FC as an important player in the work of researching and preserving the history of Arsenal FC, and we have been pleased to play our own part in the establishment of the history of the club within the Emirates Stadium. Our biggest input came following a meeting with Ivan Gazidis, Chief Executive of Arsenal. At the meeting we put forward the idea of having statues in the area surround the ground, starting with a statue of Herbert Chapman, looking towards the new stadium, symbolising the link between Chapman’s Arsenal, and the modern club. This idea was accepted and following the development of more detailed plans by the Society, initially three statues were erected, with others following. We have since also proposed to the club the establishment of a memorial to commemorate the work of Chapman, Shaw, Allison and Whittaker – the four men who were at the club from 1925 and who one after the other guided the club through almost 30 years of radical transformation from near certainties for relegation to the greatest and most famous club in the world. Our next project is to work with the club on the celebration of 100 years in the top league of English football which will occur in 2019. Our website has developed many series of articles on Arsenal’s history, ranging from individual games and supporters’ memories, to a complete history of Arsenal in the 1970s, and (currently being published) the same for Arsenal in the 1930s. Additionally we also publish an annual booklet on an aspect of Arsenal’s history with the Arsenal Independent Supporters Association, which is supplied free to all AISA members, and in 2016/17 have been developing our own programme to go alongside each home game. “The Arsenal Yankee” by Danny Karbassiyoon (intro by Arsene Wenger).